The bat-eared fox (Otocyon megalotis) is a small canid, found on the African savanna. The name Otocyon is derived from the Greek words "otus" for ear and "cyon" for dog, while the specific name "megalotis" comes from the Greek words "mega" for large and "otus" for ear. It is considered a basal canid species, resembling ancestral forms of the family. It commonly occurs in short grass lands as well as the more arid regions of the savanna. It prefers bare ground and areas where grass is kept short by grazing ungulates. 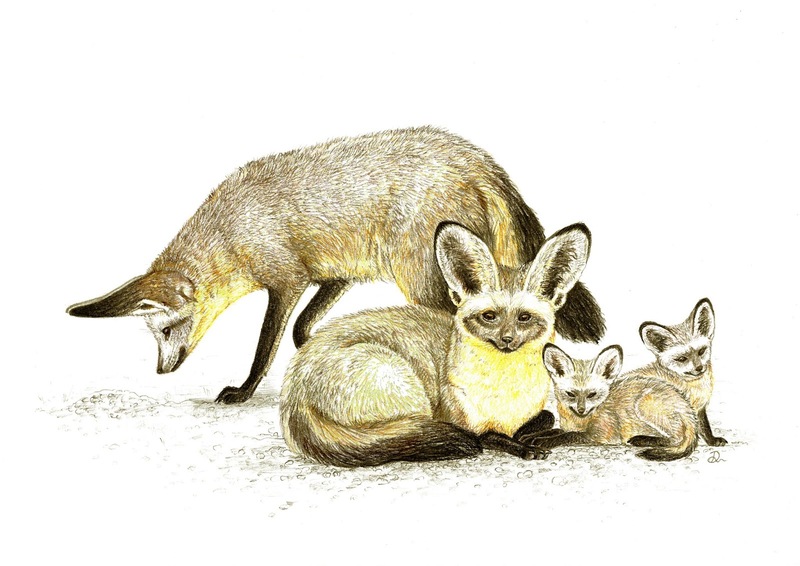 The bat-eared fox is predominantly an insectivore and uses its large ears to locate its prey. 80–90% of their diet is harvester termites (Hodotermes mossambicus). The insects they eat fulfill the majority of their water intake needs. Female gives birth to litters consisting of 1 to 6 kits. In contrast to other canids, it has a reversal in parental roles with the male taking on the majority of the parental care behavior. The bat-eared fox is a highly social animal. They often live in pairs or groups of up to 15 individuals. They forage, play, and rest together in a group, which helps in protection against predators.